The event for Architecture Week 2007, Island Block, explores the demolished London landmark of the former Greater London Council offices in SE1. The installation incorporates an interactive architectural model, laser sculpture, video, drawings, original plans and documents, and the visual artist collaborated with two musicians on an event which sonically explores materials and spaces. An discussion with the building's architects was held at the venue of the exhibition. Island Block is based on a foreboding hexagonal office building, which was modelled on WWI machine-gun pill boxes and WWII bunkers, and built by the Greater London Council in 1973 on the roundabout between Westminster Bridge, St. Thomas' Hospital, Waterloo Station and County Hall. This geometric brutalist block was intended to house 1,500 council staff but stood empty for two decades until its demolition in early 2007. The event and installation for Architecture Week marked the disappearance of this architectural failure by presenting original plans and documents relating to the defunct building and its history, and by interviewing key individuals connected to the demolished building and the planned new development, such as senior GLC politicians, central Government architects, Lambeth Borough councillors and officials, and a number of local individuals. This former council building and London landmark, stands as a ghost to the bureaucratic systems which shape the capital, and in a context of perpetual regeneration throughout London, this site, sitting close to both local government in Lambeth and national government at Westminster, is an important way of exploring the full cycle of planning decisions and development strategies which do not always reap successful legacies. The installation by the artist Charbel Ackermann also celebrated this building for its architectural merit, although it was the last, and as it turned out the weakest, addition to the South Bank's collection of Modernist structures, marked most boldly by Denys Lasdun's National Theatre, and the exposed concrete volumes of the Queen Elisabeth Hall. The event was held at the Launch Pad in the Building Centre in London, which has on average 2000 visitors per week. It was the first cooperation of this important venue for urbanism with visual artists and musicians. The exhibition ran from 18 to 30 June 2007, as part of Architecture Week 2007, contributing a new perspective on an otherwise unexplored London building and furthering the dialogue surrounding our ever-developing built environment. 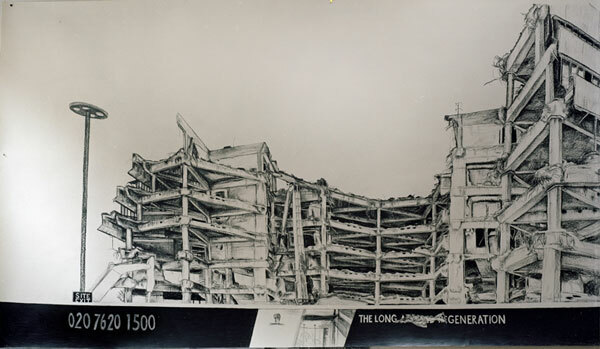 The exhibition acted as an informal 'farewell' to this architectural failure, as well as providing new historical and current information on London architecture and regeneration. Saturday 23 June (2-4 pm), we held a discussion event which brought together the former GLC architects John E. Knight and William Sutherland, building/ architecture professionals, local individuals and other visitors interested in urbanism. Charbel Ackermann is a London based artist. He uses installation, drawing, sculpture and electronic media. He has shown his work at The Drawing Center New York; The Pasadena Museum of California Art/ Fellows of Contemporary Art Los Angeles; the Walter and McBean Galleries San Francisco; the Museum of Art Lucerne, Switzerland; Irvine Contemporary and the Gallery at the Warehouse, Washington DC; Stanford University Art Gallery; L’EST London; nüans Düsseldorf; Millennium Prague. He participated in conferences and symposia e.g. at Tate Britain. He was a visiting artist at UCSC, California. Education: MA Fine Art, Goldsmiths College, London; BA Fine Art, San Francisco Art Institute.